"Misadventure of Mighty Plumber" is the twelfth episode of The Adventures of Super Mario Bros. 3; it aired alongside another episode of The Adventures of Super Mario Bros. 3 entitled "Oh, Brother!". Mario and Luigi are at Toad's house, watching their favorite television show, when Luigi cowers in fear of what's going to happen to the woman on TV. Mario complains about Luigi overreacting about the show, which they had brought their TV from Brooklyn to into the Mushroom Kingdom to watch. The TV is seen with a woman in front of a sink, from which some strange green slime is being produced. Luigi shouts at the woman to call Mighty Plumber, which she immediately does. Just as it looks like the slime, which has formed into a monster, is going to get the woman, the show cuts to a commercial. Mario and Luigi think about how Mighty Plumber will be able to save her. Hop about to get onto the racecar. Meanwhile, at Castle Koopa, King Koopa appears to be doing some sort of exercise by jumping up and down, when Big Mouth and Bully appear and join him. Koopa shouts that he is having a tantrum, not doing exercises; this is because of the fact that he found a map leading into the Pipe Land Treasury, but he knows that Mario and Luigi will manage to stop him if he attempts to go there. At that moment, Hip and Hop run in and inform him of what Cheatsy is doing; using his magic wand to make the toys in commercials magically come out of the television. 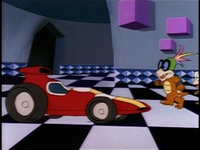 Cheatsy zaps out a race car for Hip and Hop, to Koopa's annoyance. But then, Koopa sees that The Adventures of Mighty Plumber comes back from commercials, and Mighty Plumber saves the woman that was seen earlier. Koopa gets the idea to blast Mighty Plumber out of the television and trick him into helping him get rid of the Marios. He takes Cheatsy's scepter and zaps Mighty Plumber out of the TV, then tells him that two "evil plumbers" are trying to steal the gold Coins from the Pipe Land Treasury, and that his help will be necessary in bringing the Coins to his castle to keep safe, to which a naïve Mighty Plumber agrees. 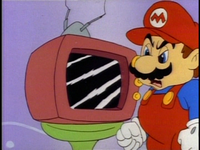 Mario, angry at the television. Back at Toad's House, the Marios' TV is on the fritz, and the distracted brothers do not notice a Fire Piranha Plant outside, until it spits flames through the window and at the wall. The ashes read "Robbing Pipe Land Treasury - Dare you to stop me... Your Enemy, King Koopa!" Mario says that they must stop Koopa, as Mighty Plumber would. King Koopa and Mighty Plumber are in Pipe Land, in front of the Underground Maze of Pipes, the entrance to the hidden treasury. Mighty Plumber cracks open an entrance, only for water to spew out all over Koopa. He decides to wait elsewhere, and thinks about what to buy with his Coins, but is soon interrupted when Mario and Luigi arrive. Koopa tells Mighty Plumber that the "nasty" plumbers are here, only for the brothers to ask for an autograph. However, Mighty Plumber attacks them with a plunger, and they leap away several times. 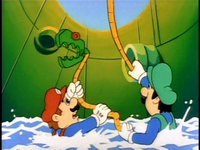 Mario and Luigi grabbing the "plumber snake". Eventually, they jump into a water-filled Warp Pipe, and Mighty Plumber sends down a "plumber snake". Luigi stuffs it into a smaller Warp Pipe growing out of the side and they swim further into the pipe. The snake re-emerges out of the other end of the Pipe, which is right behind Koopa. It grabs a hold of him and he pops out the other end, at which point he tells him to stop "fooling around", as their time to get the Coins in the treasury is minimal. In the underground maze, Mario and Luigi remember Koopa's message about robbing the treasury, and try to get there as soon as possible, only to find two pairs of footprints ahead of them. After following the footprints and going through a pipe, Mario and Luigi look around and hear Koopa's voice, talking about the vault being nearby. Luigi worries that Mighty Plumber's show will be canceled if he steals the Coins, but Mario hatches an idea to steal Koopa's map. 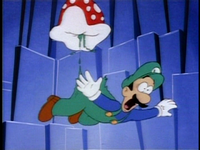 Luigi falling after the Fire Piranha Plant rips his overalls. Luigi then taunts a Fire Piranha Plant until it pops out of a Warp Pipe. It attacks Luigi and Mario struggles with it, but it bites Luigi on his rear end, until the back of his overalls are clamped in the plant's mouth. Mario uses the Fire Piranha Plant's stalk as a rope and lowers Luigi down another Warp Pipe - however, Luigi's pants rip and he falls right before Koopa. Luigi grabs the map and runs off, when Koopa tells Mighty Plumber to attack him. Mighty Plumber tosses his plunger at Luigi, and Koopa snatches the map back. Mario jumps down the Warp Pipe and stomps Mighty Plumber's foot, grabbing hold of the plunger. He throws it in Koopa's eye and grabs the map. A chase scene through the maze then begins the song "Chill Out". When the chase ends, Mario finds that Koopa and Mighty Plumber somehow got ahead of them via a Warp Pipe when their footprints are marked beyond their path. Mighty Plumber left in the flood. Sure enough, King Koopa and Mighty Plumber reach the Treasury, and Mighty Plumber breaks the door open. Koopa runs in and uses his scepter to force all the coins into his burlap sack. A sort of security system that triggers a flood goes off, and Koopa, figuring Mighty Plumber has fulfilled his purpose, reveals the truth and abandons him. Mario and Luigi appear in a gap in a high end of the wall. Mighty Plumber calls himself a disgrace to the profession of plumbing, but Mario and Luigi tell him that he is their hero, and that they learned great tricks from him like the pipe battering ram, which they immediately use - they stuff a clogged pipe into one of the pipes spewing water until it blasts out and breaks the door down. Mighty Plumber about to catch Cheatsy. Just as Koopa is about to exit the maze with the coins, Mighty Plumber throws his plunger, now attached to a rope, at Koopa. He yanks on the rope, but Koopa stomps the plunger and breaks it. He jumps into the Warp Pipe leading to Castle Koopa with the money, although Mario and Luigi quickly turn the crank of a Warp Pipe that sprays water into the one Koopa used to exit. Just as Koopa begins celebrating, the water floods his castle and sends him plummeting into a hole in the floor. Cheatsy sees the money Koopa dropped and tries to grab it, but runs away when the three plumbers show up. 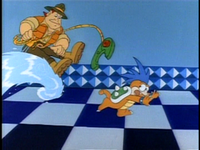 Mighty Plumber uses his snake to grab Cheatsy by the tail, and Mario tells him to send Mighty Plumber back into the television. Cheatsy does so, and Mario grabs his scepter so that no more television-related mischief will happen. The bros. then return the money to the treasury where it belongs. Later at Toad's house, the Mario Bros. are watching Mighty Plumber when the title character gives them a thumbs up. Mario proudly tells himself and Luigi that they are real heroes. When the woman calls the Mighty Plumber, the phone she is holding is yellow. When she drops it, it is colored blue. When King Koopa tells Big Mouth and Bully about his plans to rob the treasury, their heads are orange. When the woman in Mighty Plumber is seen screaming when Koopa first sees the TV, the background is Castle Koopa. The episode is set during the daytime, but when Mario says "Count on it, Luigi! ", it appears to be raining outside. When Hip and Hop call King Koopa to see what Cheatsy is doing, Koopa's eyes are green. After Cheatsy zaps the race car out of the TV, Hop's glasses lens are blue. When King Koopa says, "Oh, Mighty Plumber, those nasty-thieving plumbers are here! ", the spikes on his wrist chains and shell are red. In some scenes, the pipe in Castle Koopa for the Pipe Maze have fire. In two shots of the episode, Mario's Shoes are blue. When Mighty Plumber and King Koopa are escaping of Mario and Luigi, a purple pipe is seen changing position to they enter. When Mario and Luigi escape from Castle Koopa, Mario takes Cheatsy's wand. When they jump through the pipe, he is holding a plunger instead. When the lady on the TV calls Mighty Plumber, her cloths change to an apron. When the commercial break about to start, the Slime Monster is weirdly going up and down. When King Koopa is throwing a temper tantrum at Castle Koopa, his shell border is flashing. When Big Mouth and Bully are throwing a temper tantrum with King Koopa, some books fall on their heads, but when King Koopa is explaining that he found a map, the books are not present. When King Koopa sits down in his chair, there is a picture of him on the wall, but when he says "I gotta come up with a plan to get rid of them" the picture was not present. When Cheatsy zaps the racecar out of the TV, the racecar was still in the TV but just going off screen. When the episode first shows Mighty Plumber on the TV, he is at the door, but in the next shot, he is in front of a tan background. When Mighty Plumber says "Faster than a speeding plunger..." the wall of the house is blue, but when he swings across the room, it is shown to be green. On the TV, the Slime Monster is brown, but when the lady says "My hero!!" it is brownish greyish. When the episode first shows Pipe Land, some water geysers are flashing. When Mighty Plumber is opening the entrance to Underground Maze of Pipes, the water that shoots at King Koopa is blue, but in the next shot it is brown. After the water hits King Koopa, he says that he will wait outside, due to the fact that they are already outside. When Luigi says "A plumbers snake!!" his and Mario's symbols are flashing white. When the plumber snake is going for King Koopa, its head is red. When King Koopa says "You may have the plunger, but I got the map!!" his snout is flashing. When Mario says "You don't have it anymore!!" his face shakes. When Mario and Luigi are riding the pipe avoiding the Piranha Plants, two just appear. When Mighty Plumber grabs the map, the water is more brown. 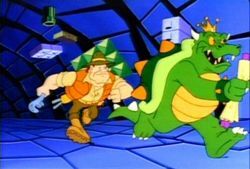 When King Koopa and Mighty Plumber are in the Treasury Vault, King Koopa is shown with a money bag. A shot of the Treasury Vault is shown twice. When the Treasury Vault is filling with water, Mighty Plumber is not present. When Luigi is talking to Mighty Plumber, his "L" is flashing. When Mario and Luigi are using the pipe as a cannon, there is a light spot on the pipe. When Mario takes Cheatsy's wand and says, "Just in case you're thinking of taking Mighty Plumber off the air again! ", his shoes are purple. When Mighty Plumber was going to catch Cheatsy, Cheatsy's head was orange. The money bag that King Koopa had had a green symbol on it, but when Mario and Luigi have it in Castle Koopa, it was black. When Big Mouth notices that King Koopa is throwing a temper tantrum, his snout is outlined. This is the first time in The Adventures of Super Mario Bros. 3 where Princess Toadstool and Toad do not appear. This is one of the only episodes where the Koopalings' roles are small. Bully, Big Mouth, Hip and Hop appear at the beginning only, and Cheatsy does not accompany King Koopa in the Pipe Maze, but Mighty Plumber. About forty-five seconds into the episode, when the show cuts to the outside of Castle Koopa, a flag similar to that of Japan's can be seen. The Mario and Luigi dartboards from the previous episode, "Oh, Brother! ", can be seen a few times. This is one of the only two episodes where Hip is seen riding a ball like he does in Super Mario Bros. 3. The other is "7 Continents for 7 Koopas". 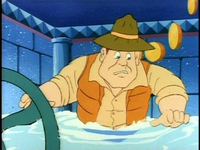 Prior to this episode, Michael Maurer had also written for Mario's first animated series, Saturday Supercade. ↑ May 20, 2015. "Misadventure of Mighty Plumber", dubbed in Romanian by KidsCo. Odnoklassniki (OK.ru). Retrieved July 23, 2018. This page was last edited on March 23, 2019, at 18:49.